When water reacts with itself to create the H3O(+)(hydroxyl) and OH(-) (hydroxide) species, one of the most fundamental and important characteristics of aqueous solutions is generated. The reactivity of a solution and its interaction with living organisms is determined in a great extent by the concentration of these two species, a variable usually measured as pH which is nothing but the negative value of the logarithm of the concentration of the H3O(+) ion. In hydroponic culture - where our plants are in great contact with aqueous solutions - the understanding of the role of the H3O(+) and OH(-) ions and their measurement as pH becomes very important if an in-depth understanding of what is going on wants to be attained. On today's post I will attempt to guide you into this micro world of pH and how and why pH changes within a hydroponic crop. Tomorrow -on Part No.2 - I will try to explain to you how plants adapt to pH changes and what a pH change actually means for a living organism. What determines pH ? This variable is inversely proportional to the concentration of H3O(+) ions and directly proportional to OH(-) ions, the more hydroxil ions you have the more acidic your solution will be (the lower the pH) while more hydroxide ions will increase your pH and give you a higher pH reading. It is important to understand here that hydroxyl and hydroxide ions determine each other's concentration. Since water's self-reaction equilibria must be maintained, the sum of pH and pOH must always be equal to 14 (a neat consequence of chemical equilibrium theory). When the concentration of hydroxyl and hydroxide ions is equal, pH and pOH contribute equally to the solution and they are therefore both 7, reason why the pH of a neutral solution has this value. Now that we know a little bit about pH we can understand better what happens when plants interact with a nutrient solution. When a plant is put within a given solution it wants to absorb the nutrients it needs to grow. These nutrients are avilable as ions that have a given charge. For example, nitrogen is absorbed as the nitrate ion (NO3(-)) while potassium is absorbed as the K(+) ion. When a plant takes potassium in, it deplets the solution of a positive charge. Since the solution must remain neutral the plant gives the solution an H3O(+) ion to compensate. 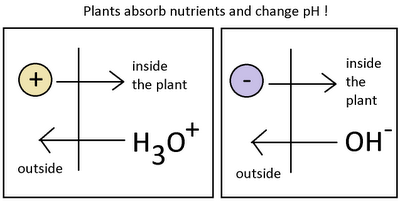 The plant has therefore decreased the pH of the solution by absorbing a potassium ion. When nitrate is absorbed - an ion with a negative charge- the plant does the opposite and exchanges the nitrate for an OH(-), the pH of the solution is increased. If plants absorbed nutrients in a perfectly symmetrical fashion, they would not increase or decrease pH as overall charge changes would be compensated. However - as no one is perfect- plants absorb nutrients at different rates and they therefore create a "pull" towards a certain pH region. 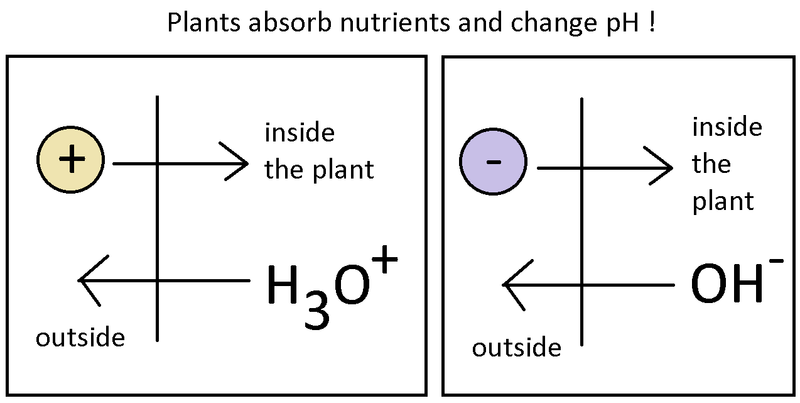 If a plant absorbs nitrate heavily it will start to contribute far more OH(-) than H3O(+) ions into the solution and the result will be a net increase in pH. Depending on the composition of the nutrients and the overall growth stage of the plant, different net movements in pH can be achieved by the plant. The most influential factor in the changes of pH within a solution is generally the composition of the nitrogen component of the solution. When plants absorb ammonium ions NH4(+) they tend to decrease pH while nitrate - as mentioned above - tends to increase pH when absorbed. If you contribute a percentage of the nitrogen in your solution as ammonia the net effect will be a beneficial "absorption pH buffer" since plants will take nitrogen in both forms, effectively delaying the onset of important pH variations. Of course, the ratio of nutrients also performs a vital role since plants' nutrient absorption mechanism are largely non-specific and they are greatly influenced by the different concentrations of nutrients within the solutions. Having a nutrient solution designed to provide an adequate balance will be vital in helping you control pH fluctuations. On part two of this "understanding pH in Hydroponics" post I will talk about the range of pH plants can live in, how they adapt to changes in pH and other interesting aspects that will help you better understand the role and true importance of pH within a hydroponic crop. I hope that today you have acquired a rough idea of what pH represents, the nature of pH changes and some basic things that can be done to improve the pH balance within your hydroponic culture. sir i just want to know will tds meter show you exact amount of N P K present in water? for hydroponics if i add NPK as 20.20.20 after some days if i measure with tds meter wil ot show some what like 10.15.13 remaining. my question may be silly but i want to know if you can help? I have started hydroponics Lettuce 15 days back. I am maintaining the pH to 5.5-5.8, however, after around 4 hours pH is increasing to 6.5 and above. Please guide me, why it is happening and how to keep in this range for longer time. I understand that ammonium nitrogen is an effective method to control the upward swing of PH (usually seen during the vegetative growth period....large nitrogen uptake); are there any effective control strategies for controlling the downward swing of PH in late flowering? In my experimental hydroponics system...i am working on cherry tomatoes...the problem that I am facing is that the pH as well as the EC both show a significant increase...i am still clueless with regard to it...for your information I am using Coco peat as growing medium...(its just my guess that some cocopeat partlicles have accumulated in the nutrient reservoir through net pots, causing an increase in EC)..